Hines has a vision of creating a new standard for office environments in the Anaheim Canyon submarket. 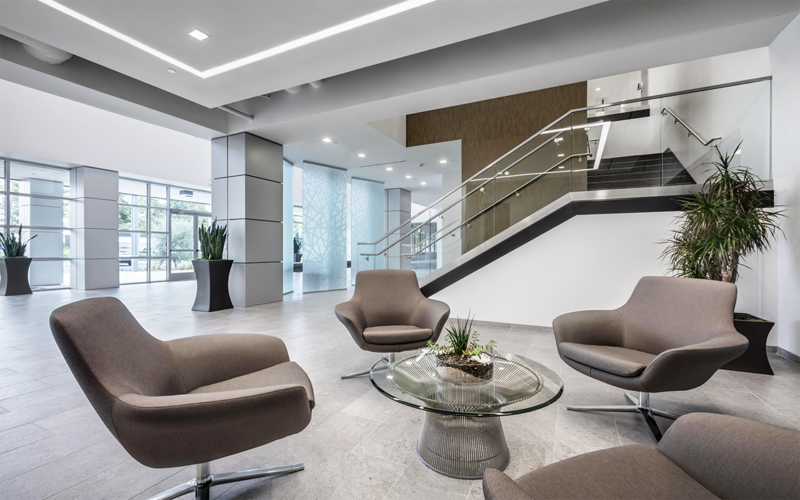 Executing our “strategy first, then design” approach, Westgroup Designs delivers a redevelopment design solution for the Canyon Corporate Center aimed at attracting flex-office and creative tenants. Hines is a global real estate investment firm with a presence in 19 countries and a portfolio totaling 531 properties. They are one of Orange County’s five largest office landlords on a square footage basis with an office portfolio that tops 3 million square feet. Hines had a robust redevelopment vision for their 155,000 sf Canyon Corporate Center located in Anaheim. They partnered with Westgroup Designs to “transform the [1970s office building] into one of the most unique and differentiated office environments in the Anaheim Canyon submarket.” Providing workplace strategies, programming, architecture and interior design services, Westgroup Designs developed a design solution for the Canyon Corporate Center that features strategic improvements to interior and exterior spaces, with a focus on flexible tenant spaces, engaging common areas, place-making building facades and pedestrian-centric outdoor areas. Creating a sense of place was a key area of focus for repositioning the building’s main entrance. The proposed exterior improvements at the main entrance include replacing the ubiquitous mirrored glazing found throughout the building with a dual-glazed, high-performance, clear glass to allow visitors to see into the revitalized double-height lobby space within. Working with the existing structure, the main entrance is further enhanced by the addition of a perforated metal screen wall, entrance canopy and entry plaza improvements that provide new opportunities for property addressing and branding. Connecting the experience from the outdoor main entrance to the inside common areas, we transformed the 30-year-old lobby into a 2-story modern, inspiring environment staged with long vistas and distant views. The focal point of the new lobby is a 2-story tall perforated decorative metal structure that portrays abstract imagery from the region’s historical and natural landscape. The 4,000 sf lobby space also includes a concierge, digital directory and collaborative lounge. We reconfigured the tenant spaces into flexible, high-bay offices with large windows and skylights. An old 25,000 sf warehouse was converted into an industrial office space that includes three 14ft high glass roll up doors with direct access to the building’s outdoor areas creating generous daylighting and flexible indoor-outdoor environments. Activating underutilized outdoors areas, our landscape design gives tenants access to three outdoor amenity areas to dine, lounge, collaborate and socialize in, including an 8,000 sf entry plaza with seating and pedestrian walkways and a 7,000 sf private courtyard. Our resulting design for the redevelopment of Canyon Corporate Center hones in on the goal of attracting flex-office and creative tenants that will strengthen business outcomes for Hines.